Shown seated, from left, are Bonnie Parr, wife of The Times-Gazette Highland County Athletic Hall of Fame inductee Willard Parr Jr.; Willard Parr Sr.; John Parr, son of Willard Parr Jr.; Britton Haines, winner of the 2018 Times-Gazette Highland County Scholar-Athlete Award; hall of fame inductee Mike Willson; and hall of fame inductee Kay Cummings. Also shown are the 2018 scholar-athletes. 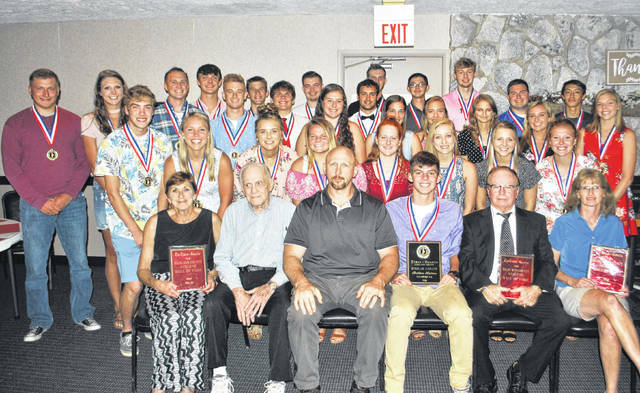 A capacity crowd gathered Thursday at the Ponderosa Banquet Center in Hillsboro to honor this year’s inductees into the Times-Gazette Highland County Athletic Hall of Fame and recognize scholar-athletes from around the county. The ceremony, now in its ninth year, celebrated the induction of four individuals into the hall of fame – the late Gerald “Red” Armstrong, a 1923 graduate of McClain High School; Kay Cummings, a 1982 graduate of Fairfield High School; the late Will Parr Jr., a 1963 graduate of Hillsboro High School; and Mike Willson, a 1955 graduate of Hillsboro High School. In addition, 41 senior student-athletes, nominated by their coaches, were acknowledged at the event. Times-Gazette Assistant Editor Jeff Gilliland, who hosted the event, said this year marked the most student-athlete nominations the newspaper has received. The winner of the 2018 Times-Gazette Highland County Scholar-Athlete Award and accompanying $200 scholarship and plaque was Britton Haines, a Hillsboro High School senior. On Thursday, Times-Gazette Publisher and Editor Gary Abernathy welcomed attendees to the event, and Gilliland introduced each of the hall of fame inductees before they, or individuals speaking for them, took the stage. During Willson’s school days in Hillsboro, he parlayed good advice and a relentless work ethic into becoming an eight-time national champion collegiate gymnastics coach. Willson coached teams to seven junior college national championships, one Division I NCAA National Championship at Ohio State, and four national runners-up. He coached 85 national junior college All-Americans, three Big Ten championship teams, and was on the U.S. Olympic Committee from 1968-72. Willson spent much of his career at Odessa College in Odessa, Texas. The late Gerald “Red” Armstrong grabbed the attention of legendary Greenfield coach Frank L. “Duke” Hayes as a chunky freshman from Bainbridge nearly 100 years ago, and before he was done with his athletic career as both a player and a coach, he had etched his name into the annals of time. Armstrong was the school’s first All-Ohio athlete, earning letters in football, basketball, baseball and track. He went on to Wittenberg College and won letters in football, basketball and baseball, coached for a time in Akron, then returned to Greenfield to coach McClain football from 1929 to 1941. His teams compiled a record of 65-29-8 and won South Central Ohio League titles in 1938, 1940 and 1941. The 1938 title was McClain’s first outright SCOL football championship. Ninety-four-year-old Paul Orr, one of Armstrong’s football players, was set to speak for Armstrong at the event Thursday, but was unable to attend. In recent interviews, Orr described Armstrong as tough-handed but kind. The late Willard Parr Jr. “ate, slept and drank football,” according to his father, Willard Parr Sr., who spoke at the event. After graduating from Hillsboro High School, Parr Jr. went on to Ohio University where he was an All-American lineman. He was receiving letters from numerous National Football League teams and appeared destined for a professional career, but injured a knee late in his junior season and that ended his dream. Parr Jr. passed away in 1997 after a battle with brain cancer. Parr Sr. said his son “was always fast” — even in the way he was born. The elder Parr said he was sitting in the car one day with his wife, Irene, as she was pregnant with Parr Jr., when she suddenly said they needed to go into the house. “Thirty minutes later, we had an eight-pound, 10-ounce boy,” Parr Sr. said. Kay Cummings held basketball records at FHS for years. She was a center fielder and leadoff hitter on a Lady Lions softball team her junior year that won sectional and district tournament championships, and in her senior year went undefeated in the Southern Hills League, then won sectional, district and regional tourney titles before losing to eventual state champion Archbold, 7-2, in the state semifinals. When she graduated, she held the Fairfield girls basketball scoring record with 1,054 points. At Wilmington College, she was a four-year starting point guard in basketball and won another free-throw percentage title her sophomore year. In softball, her 1983 WC team won the Western Buckeye Collegiate Conference and NAIA District 22 titles. In 1986, Cummings was named to the Western Buckeye Collegiate All-Conference team and won the team MVP award. On Thursday, Cummings said she was honored to be inducted into the hall of fame, and shared stories from her youth, when she hung out with a group of children in what they called the “east side” of Leesburg — until they found out it was actually the south side.